Hi there! It's my turn to be featured on the CASology blog today as part of our 100th challenge celebration. I hope you've all played along with us and our cue word Celebrate! I'm so proud to be a part of such an amazing design team. It's a fabulous group of gals who are super supportive and seriously funny. Love you, ladies! I'm sharing a quick card that I made using random die cuts that have been sitting on my desk for ages. Instead of decorating my trashcan they're providing a bright an cheerful hello! I've got some blog candy to give away as part of our celebration. Just tell me your current favourite product and I'll pick a winner! You have until 10am EDT tomorrow! Oh, these sentiment stamps are just what I need. Thanks for the chance to win. I'm dreaming to get a Silhouette portrait right now. Great feature over at CASology Jen! Love getting to know a little more of you. You style is so hip and cool and today's card is a perfect example! Of course do not put me into your draw! I love being on CASology with you my friend! Jen it was nice learning a little bit about you. I love your style and today's card is a good example. What I like the best is a difficult question but it would probably be MFT Abstract Art stamp set, which is so versatile and a lot of fun to play with. I won blog candy from Kimberly so you do not have to put in my name. Thanks. Oohhhhh love the inlaid diecutting on here! And great colors! Thank you! Oh and my fav. 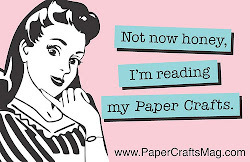 Product is my cutter bee scissors! Hi Jen! No need to count me in the drawing, I just wanted to stop by to say how much fun it is being on the CASology DT with you! Your wit and sense of humor always make me smile, and so often that wit shows up in your awesome cards! Love that! I think you already have guessed that Paper Smooches are among my favorite =] I'd love anything by Winnie & Walter, and I've yet to find the Clearly Besotted stamp set I've been yearning for in stock =] Thanks, Jen! It was so nice to read more about you Jen! LOVE your CAS card. My favorite product right now is my word dies. Love them. Such a bright happy card! Great to see you highlighted on the CASology blog today -- and I'm looking forward to working with you and the rest of the team in July! As you know, my favourite stamping product is ALWAYS embossing powder. :) Lately my little Cuttlebug has been coming in a close second, though. Fun card! Love the color combo and the fun way to show off the die cut 'hello'! My favorite thing right now is all the dies! So many to choose from! Love the card. What a great way to use up the bits. Favourite product right now? Hmmmm.... I suppose that's my Big Shot. It seems hardly a day goes by without cutting or embossing something. Love your fun card Jen. Of course, loved reading about you at CASology. My favorite product right now is the new PS set I just got...Bold Buzzwords. I love sentiment sets. 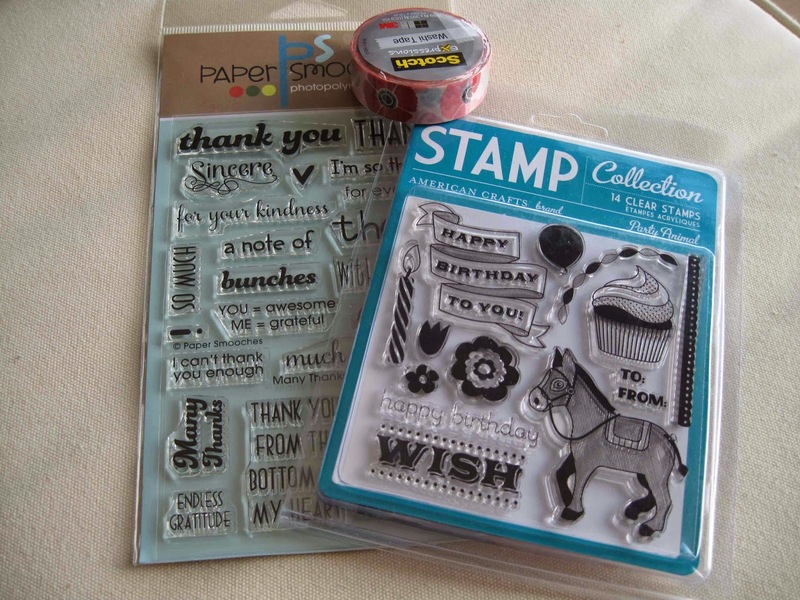 My favorite products are stamps and inks....loves to play with them when making cards. 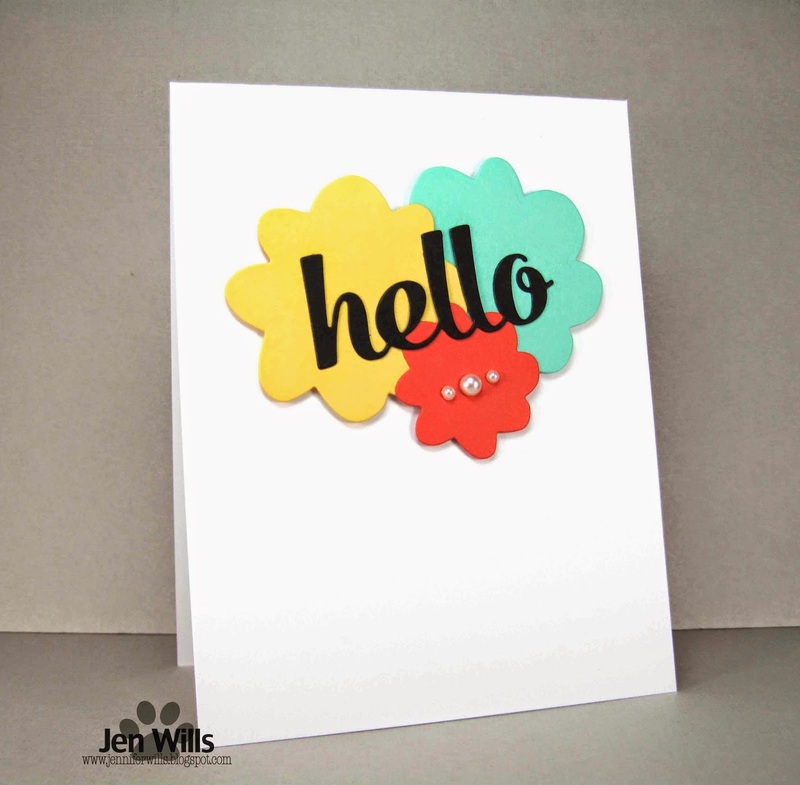 What a great design with the layered die cuts - a bright and cheerful HELLO card Jen! I'm into anything Ranger/Tim Holtz right now!